I may have seen the being gliding west, away from Chicago. 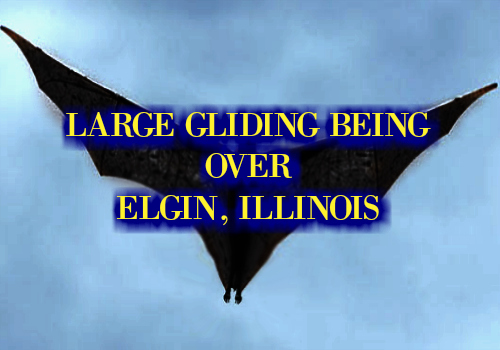 I work in Elgin about one mile north from I-90 and about 45 mins northwest of Chicago. I was outside of my work and looking skyward at the time. The being was very high up but I could tell it was very big, but it was the odd shape. It was at the height of mid-flying airplane. This was right around 11:45AM on August 1, 2017. It looked just like the thing in that pic that you have on your 1st sighting (2011). The pic with the Native American statue. It looked darker though, but that could have just been the distance that it was, because it was high and it was going away from me also. I was hoping it would turn around but it just kept going on a straight glide westward. I was getting my phone out too late it would have looked like a dot if I would have tried to get a pic, that's why I was hoping it would turn around. I didn't notice it flapping its wings, that's why I keep saying that it was gliding. It kept in a very straight direct motion. I plan on taking breaks for the next few weeks around this time in case it passes again. Since this day it has been very cloudy out so I haven't been able to get a good look at the sky but I believe I might have seen it in the distance the next day playing in the clouds. If it is a creature of habit I hope it'll keep passing around my area around the same time. Like I said I saw something that looked like a person in one of those squirrel suit but if you know the suburbs, there is probably no way it could have been. I have been watching the skies even closer since then and at this point I want to say whatever I saw would have been the size of a small plane possibly. But I didn't have anything to reference the size since it was so far up.